It’s a common question. Because most don’t see IT as an issue until it is one. When there is an IT problem, it is often overwhelming, overtaking every other aspect of your business. That’s why we love the MSP model. As a managed IT services provider, we know the problems that you could be facing. 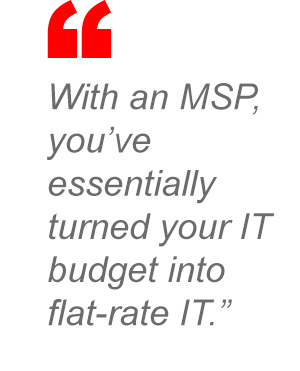 So, why switch your IT to an MSP? We’ll show you. At one time or another, we’ve all been on those troubleshooting tech calls. Is your computer plugged in? Is the power on? Have you taken the computer out of the box? With every new tech you call, it feels like you’re starting over. The problem is, they don’t know your system. How could they? They probably didn’t set it up and have no idea what kind of rigged wiring and infrastructure your IT guy may have created for your office. Most businesses do this. They use capital expenses to buy a bunch of computers for the office and assume they’ll work like a charm. But it gets complicated. Especially when security is involved. If IT isn’t driving your company’s innovation, if you aren’t using your technology to meet your business goals, then you may be falling short. A great MSP can change all that. MSPs make your technology work toward your business goals, not the other way around. Whatever industries you want to work within, however, you want to improve (even those “where do you see yourself in five years” questions), your MSP should drive you there. When you have generic tech support, the weight is all on your shoulders. Where’s the impetus for speedy work when they get paid by the hour? When every call from you translates to billable hours, then it keeps you in a precarious position. At that point, you would only call in the case of an emergency. And who would blame you? An MSP takes the burden off your shoulders. No longer do you wait for a technical emergency before you pick up the phone. As a partner in your business, an MSP knows your systems, knows your goals, and is compelled to deliver you the best solutions for your needs. One of the biggest problems with IT is the unpredictability in spending. Every call results in an unexpected invoice that could damage any headway you’ve made in your profits for that quarter. With a managed services provider, you’ve essentially turned your IT budget into flat-rate IT. With a predictable monthly bill, you’re never surprised with an IT invoice. Plus, you can plan out growth months and years in advance. Likewise, your managed services provider gets a set fee each month. By virtue of that, resolving any surprise IT issues as quickly as possible is now their top priority, since the longer they have teams on your site, the less profit they make. As your managed services provider, RedNight Consulting takes pride in preemptively solving problems. By always monitoring for potential problems, like bandwidth issues or impending server doom, we can address potential issues with your system before the problem ever arises. As your pro support team, we want to help transform the way you think about your IT. Contact us today to uncover the possibilities.